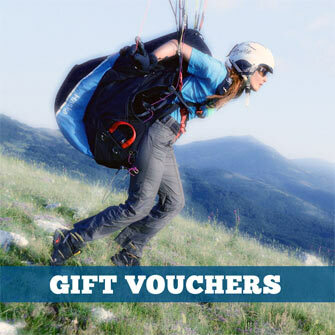 All paragliding wings listed on our shop. 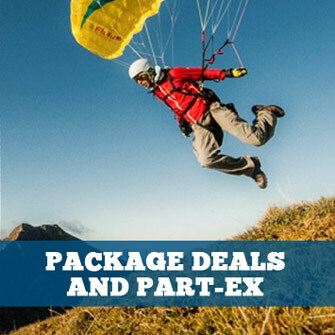 We can also supply other paragliders not listed here. Spread your wings like a bird, step lightly into the air and simply fly away: the ALPHA 6 is your perfect partner for making this a reality. Latest technology combined with the highest quality materials ensure your pleasure and safety while you learn, and for long afterwards. Maximum flying fun guaranteed. ALPHA 6: Come fly with me. New ALPHA 6 24 Bordeaux in stock — on sale! We have a brand new Advance ALPHA 6 size 24 colour Bordeaux in stock, now on sale! We've completed it's pro-dealer glider checks, so it's ready to buy and fly. Due to its excellent takeoff qualities, high stability, damped behaviour and compactness the ALPHA 6 is also ideally suited to paramotoring. Hybrid-Risers, which can also be used for flight without the motor, are recommended. Flying should be fun. If you make ten flights a day as a professional tandem pilot - where efficiency, economy and passenger safety share priority – flying is often hard work. In the BIBETA 6 we have managed to achieve the difficult objective of packing the best of current tandems into one product – with no compromise: fun all round - all day. The EPSILON 9 is characterised by its quiet ride through turbulent air and a fun feel-good factor which brings the joy of flight. Technical upgrades give better performance and even more precise handling than the EPSILON 8, with the same passive safety. What is your cross country dream? To manage your first 200 kms? To land in front of your house after a long day's flying, or just set off and see how far you can get? The IOTA 2 offers you all of the most important ingredients for these achievements: efficient performance and relaxed piloting in all conditions. The latest technology gives the wing an outstanding polar curve for its class. OMEGA XALPS 2 in stock — on sale! We have brand new OMEGA XALPS 2 in sizes 23 (80-97 kg) and 24 (90-110 kg) in stock, now on sale! We've completed their pro-dealer glider checks, so they're ready to fly. Intended as a Light Racer for the X-Alps 2017, and developed as a High-End cross country wing: the OMEGA XALPS 2 benefits from extensive SIGMA 10 development and the knowledge won from the OMEGA XALPS, in equal measure. This Light Racer not only shows very high directional and pitch stability in lively air, but has an exceptionally effective and easy-to-push gas pedal. And one should not discount sensational weights from just 3.3 kg! Do you know how to do acro? We do! The OMIKRON combines high level, balanced dynamics with uncomplicated handling, and was developed by accomplished acro pilots (e.g. Christian Proschek and Michael Maurer) for acrobats and professionals. The OMIKRON has plenty of steam if you ask for it, but excess energy can always be effectively reined in with the brakes. Enjoy the freedom and versatility – in the air and on the ground. The new PI 2 is one of the lightest small-packed-volume serial wings on the market and, with the choice of four sizes - each with three weight ranges – is also one of the most versatile paragliders available today. Equally at home in thermals, for Hike & Fly or as a miniwing: with the new PI 2 it’s you who decides. Light, fully-fledged and small when packed: many have been waiting for this tandem wing for Hike and Fly with friends and family. Now it’s here! The PI BI in one 37 m2 size weighs only 4.8 kg and has a takeoff weight range from 100 to 180 kg. This ADVANCE Light Tandem merges PI philosophy with the popular flying qualities of the BIBETA 6. As a light and compact Performance-Intermediate from 3.4 kg the XI satisfies the most diverse pilots’ needs; and does it in style. Whether near or far, difficult flying or exciting adventure. The new light high-end B goes with you for bivouac flying, Hike & XC-fly tours, travelling or discovering new routes in remote regions. XI – realise your story. The Bolero 6 is Gin's new entry-level paraglider for schooling to first XC’s and beyond! Besides an even more relaxed flying, the new Bolero offers an improved take off behaviour. The wing is certified EN A in 6 sizes and is available to order now. The Boomerang 11 combines many incremental improvements made over 2 seasons of development to deliver one huge benefit: more performance. Carve, power and dynamics for advanced slalom and freestyle paramotor pilots.